Each capsule contains fluconazole 150 mg.
Fluconazole is a triazole antifungal drug which in sensitive fungi inhibits cytochrome P-450 dependent enzymes resulting in impairment of ergosterol synthesis in fungal cell membranes. It is active against a broad spectrum of yeasts and other fungal pathogens including: Blastomyces dermatitidls, Candida spp., Coccimoides Immitis, Cryptococcus neoformans, Epidermophyton spp., histoplasma capsulatum, microsporum spp., and trichophyton spp. dose. Multiple dosing leads to increase in peak plasma concentrations. Steady-state concentrations are reached within 5 to 10 days but may be attained on the second day, if a loading dose is given. The plasma protein1J1nding offluconazole is 11% The drug is widely distributed throughout the body with an apparent volume of distribution approximately equal to total body water. Concentrations in breast milk, joint fluid, saliva, sputum, vaginal fluid, and peritoneal fluid are similar to those achieved in plasma Concentrations in the cerebrospinal fluid range from 50 to 90% of plasma concentrations even in. the absence of meningeal inflammation. Urinary- concentrations and those in skin are 10-fold greater than in plasma. 80% or more of fluconazole is excreted unchanged in the urine; about 11 % is excreted in the urine as metabolites. The pharmacokinetics of fluconazole are markedly affected by reduction in renal function. There is an inverse relationship between the elimination half life and creatinine clearance. Fluconazole is removed by dialysis. – Superficial mucosal (oropharyngeal, esophageal, or vaginal) candidiasis. – Dermatomycosis, including tinea pedis, tinea corporis, tinea cruris, tinea versicolor, tinea unguium (onychomycosis) and dermal candidal infections. – Systemic candidal infection e.g., Urina tract infections, peritonitis, candidemia, di minated candidiasis, and pneumonia. – Deep mycoses, including blastomycosis, coccidioidomycosis, histoplasmosis, and sporotrichosis. – Prophylaxis for fungal infections in patients malignancy who are receiving chemotherap ractiation therapy. – Prophylaxis of serious fungal infections in patients with human immunodeficiency virus (HIV) infection. for the development of more severe hepatic injury. Fluconazole therapy should be discontinued if signs & symptoms consistent with liver disease develop. 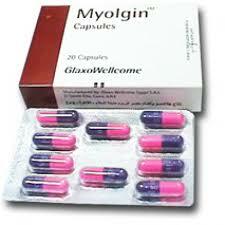 • Patients have rarely developed exfoliative skin disorders during treatment with fluconazole. In patients with serious underlying diseases (predominantly AIDS & malignancy), these have rarely resulted in a fatal outcome. Patients who develop rashes during treatment with fluconazole should be monitored closely and the drug is discontinued if lesions progress. pregnant women. Fluconazole should be used during pregnancy only when the benefit clearly outweighs the risk. • Lactation Fluconazole is excreted in breast milk at concentrations similar to plasma. Therefore, the use of fluconazole in nursing mothers is not recommended. include abdominal pain, diarrhoea, flatulence, nausea, and vomiting. Skin reactions are rare but exfoliative cutaneous reactions such as toxic epidermal necrolysis and Stevens- Johnson syndrome have occurred, more commonly in patients with AIDS. Concomitant administration of rifampicin with fluconazole’ results in reduce plasma concentrations of fluconazole. Administration of hydrochlorothiazide with fluconazole has resulted in clinically insignificant increases in plasma fluconazole concentrations. Fluconazole may interfere with metabolism of some drugs if given concomitantly, through the inhibition of cytochrome P-450. This may account for the reported increases in plasma concentrations of phenytoin and sulphonylurea hypoglycaemics and reductions in the production of a toxic metabolite of sulphamethoxazole. Increases in plasma concentrations of cyclosporin, rifabutin, tacrolimus and zidovudine have also been reported. theophylline. The efficacy of oral contraceptives may be reduced. 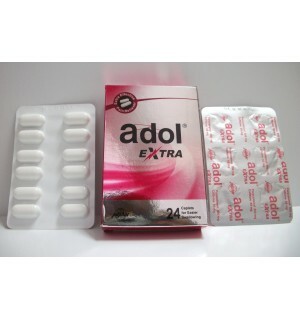 dose may be used. The duration of therapy should be individualized, but ranges from 4-12 months. 2-For dermal infections including tinea pedis, corporis, cruris and candida infections : the recommended dose is one capsule (150 mg) once weekly. Duration of treatment 2-4 weeks, tinea pedis may require up to 6 weeks. Tinea versicolor: 2 capsules (300 mg) once weekly for 2-3 weeks. Onychomycosis: One capsule (150 mg) once weekly for 3-6 months (fingernails) and 6-12 months (toenails). One capsule (150 mg) daily for 7-14 days (except in severely immunocompromised patients); for 14 days in atrophic oral candidiasis associated with dentures; for 14-30 days in other mucosal infections: esophagitis, non-invasive bronchopulmonary infections. primary course of treatment for acute cryptococcal meningitis in patients with AIDS. Sinc fluconazole is primarily excreted by the kidneys, fluconazole dosage must be adjusted for renal impairment according to creatinine clearance. No dosage adjustment is needed in patients with renal impairment given single-dose therapy. 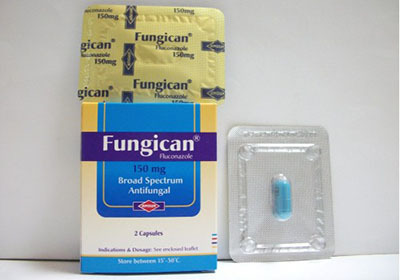 Fungican® capsules: Pack of one capsule containing 150 mg fluconazole. H-Obour City, Cairo, Egypt. .